It is my hope that this background information will not only help to make you feel more at home in the kitchen when it comes to preparing the corresponding recipes, but will also provide useful insights to help you practice & enjoy the experience of responsible caviar consumption. Origins & Classifications: Caviar is basically the processed, unfertilized fish eggs (or roe) of wild sturgeon. Sturgeon are one of the world's oldest vertebrate species on Earth, dating back to prehistoric times. Going back over 250 million years, they've even survived the dinosaurs! They can live a hundred years, grow to over 20 feet in length, and weigh more than 2,200 lbs.! The four varieties of "true" caviar, (i.e., sturgeon roe), are Beluga, Osetra, Sevruga, and Sterlet, (the last of which is very rare & no longer sold commercially). Each type of caviar is named after the species of sturgeon that produces them. There are several compelling reasons to make the switch to sustainable caviar: For one, sturgeon roe is rare precisely because sturgeons are on the verge of extinction. 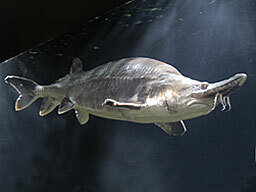 At present, there are only 27 species of sturgeon left, all of which are on the endangered species list (! ), and of that subset, 4 species haven't been spotted in quite some time and so, not surprisingly, are currently listed as "possibly extinct." Just how dire is this situation? In March 2010, the IUCN reported that over 85% of all remaining sturgeon species are now classified as "endangered or critically endangered," (i.e., they are at serious risk for extinction), making them the most critically endangered group of species of all. Of course, as species of plants & animals start disappearing from our planet, this creates an imbalance in the food chain that can really wreak havoc with the ecosystem. This chain-reaction affects every living species on the planet, including humans! Of course, we can reverse these trends via global conservation efforts & responsible consumption practices. Of the three remaining types of commercially sold, "true" caviar, Beluga is the generally considered to be the best. However, due to its high demand over the years, overfishing has put undue strain upon the species, also making it one of the rarest, and thus, most expensive types of caviar. Also compounding the issue is Beluga's slow maturation cycle: In order to produce eggs, the Beluga must first reach adulthood, which takes at least 20 years! In an effort to protect this endangered species, the United States Fish and Wildlife Service, as of 2005, has banned the import of Beluga caviar from the Caspian Sea as well as the entire Black Sea basin. At present, it is illegal to import Beluga caviar into the US and also to transport any existing Beluga caviar currently located in the US across state lines. And finally, here's yet another reason to make the switch to sustainable caviar: Your health. :) Consider this: Contaminated water has been a huge problem in the Caspian Sea, where a large majority of wild sturgeon live. Not only do these fish swim in polluted waters, but they eat food from those waters as well. And, due to the fact that all species of wild sturgeon have remain unchanged since their beginnings, their immune systems have not adapted to protect them against the pollutants of modern industry. Because they have not evolved and thus, cannot fight off the ravages of pollution, think of what that means for you if you were to eat wild sturgeon roe. Now consider the advantages of eating sustainable farmed caviar: Unlike wild sturgeon, farmed sturgeon swim in clean artesian well water and are fed all-natural feed. Also, equally important is the following factor: Farmed sturgeon are not killed in order to extract their caviar. Instead, the eggs are removed in a C-section like fashion, the wound is stitched up to keep the fish alive, and then the fish is then returned to the water. This way, the sturgeon population doesn't have to be endangered in the process, and the female fish population can continue to produce more roe during their lifetime. Contrast this to the historical practices of commercial wild sturgeon fishermen, who stun the fish by clubbing its head and extracting the ovaries. 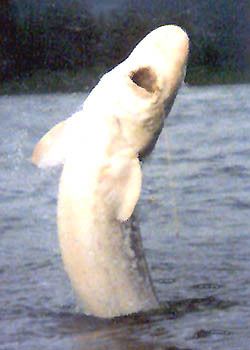 The wild sturgeon is basically clubbed to death in order to obtain their roe. Once the roe is extracted, that's one less female fish to continue the cycle of life for the wild sturgeon population. Processing and Packaging Methods: Ever wonder how caviar is processed? Here's the basic method: The caviar maker, or ikrjanschik in Russian, takes a large sac of roe and runs it over a very fine mesh screen that separates the eggs into separate pieces. The eggs then fall into a large bowl, whereupon the caviar maker adds precise amounts of pure sea salt (and sometimes other ingredients as well). (Salt is added to prevent freezing. It's used both as a preservative and as a curing agent.) The caviar is then graded and packed into 4 pound tins. Importers will then repackage these tins into smaller amounts, which are typically around 1 oz. in size. 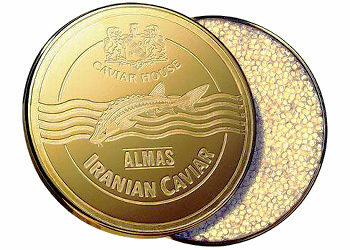 Beluga caviar is always packaged in blue tins, Osetra in yellow, and Sevruga in red. Other types of fish roe are typically packaged in glass jars. The above steps must be done swiftly and gingerly, both to maintain freshness and protect the fragile nature of the eggs. It's a painstaking process, which requires a lot of skill and many years of experience. This is why a minimum of 10-15 years of apprenticeship is required before an ikrjanschik is allowed to process caviar on his own. Salted: This method of processing is considered to be slightly less desirable in quality than Malassol, and is sometimes referred to as 'semi-preserved' caviar. It has a higher salt content, containing up to 8% salt. While the increased amount of salt is used to extend caviar's shelf life, it also negatively affects its flavor. This type of caviar is generally destined for the US marketplace, where borax is thankfully prohibited by law. Pressed caviar: Pressed caviar, or payusnaya ikra in Russian, is the next rung down in terms of quality, although its shelf life is greater than the above two types. When kept in a refrigerated and unopened, sealed container, pressed caviar can keep for up to 8 months, that is, from the time it hits the store shelves. Typically made from too soft, immature, or overly ripe Sevruga or Osetra roe that's been damaged in processing, it's treated by placing it into highly salted, hot brine, shaken until its no longer milky, stored into small oak barrels coated with paraffin, and then pressed through cheesecloth into a soft, jam or paste-like consistency. (This removes any excess liquid.) Once the only available method used to preserve caviar, this type of caviar was once so thick that it could be sliced with a knife. (This is because it used to be dried and pressed more in the past.) 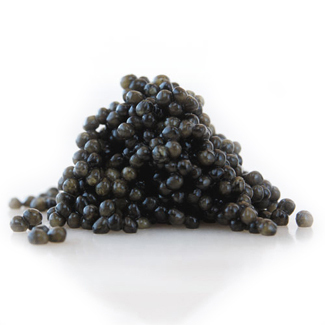 Not surprisingly, pressed caviar has an extremely strong and concentrated flavor. (It takes 15 lbs. of roe to make a 2.2 lb. of pressed caviar!) In addition to being intensely salty, it's also exceedingly fishy tasting, and thus, is often considered to be an acquired taste. :) It's also very difficult to find outside of Russia. Of course, all of these factors probably play into the reasons behind its appeal to caviar connoisseurs. ;) Even though it's of lower quality than malassol or salted caviar, it's often recommended for cooking, and is still considered to be a favorite amongst many chefs and aficionados alike. Pasteurized: This type of caviar is the lowest on the totem pole in terms of quality, texture, and taste, but has the longest shelf-life: From the time it hits the store shelves, pasteurized caviar can be kept for in a refrigerated and unopened, sealed container for up to a year, but needs to be consumed within a few days once opened. During the pasteurization process, the caviar is heat treated and then vacuum packed in glass jars. From there, it's then placed into hot water baths at a constant temperature of about 140°F. This process typically occurs with 3-4 hours after the fish has reached the processing plant, in order to prolong its shelf life as much as possible. There are those who claim that pasteurization, when carried out correctly, shouldn't change the flavor of the caviar, although the eggs will typically become a bit firmer. As you can see, when it comes to caviar, there's generally a trade-off between taste and shelf-life. ;) Therein lies the paradox: Less salt means better flavor but faster spoilage and higher prices, while more salt means slower spoilage and comparatively lower prices but a lower caliber flavor. As you can see, the amount of salt added to caviar is often inversely proportion to its overall quality.